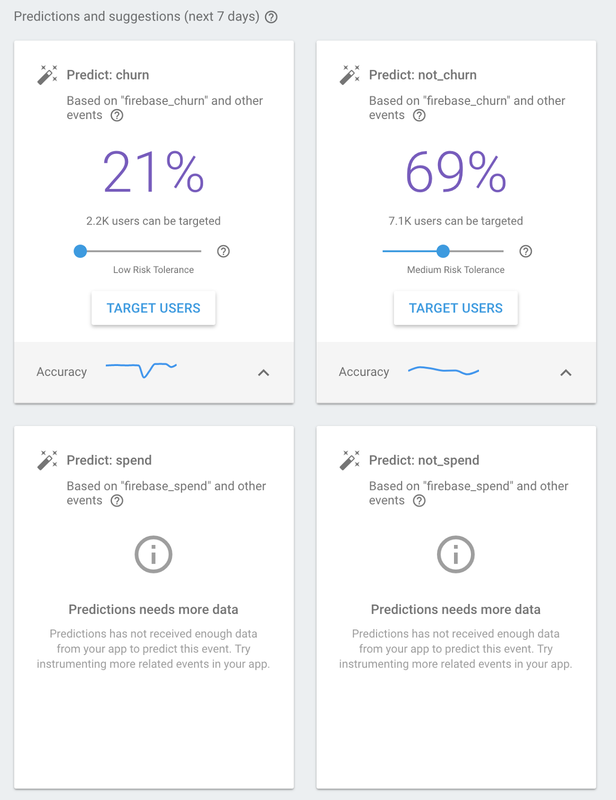 We're delighted to announce the beta launch of Firebase Predictions. With this we are bringing the power of Google's machine learning systems to every developer that uses Firebase. 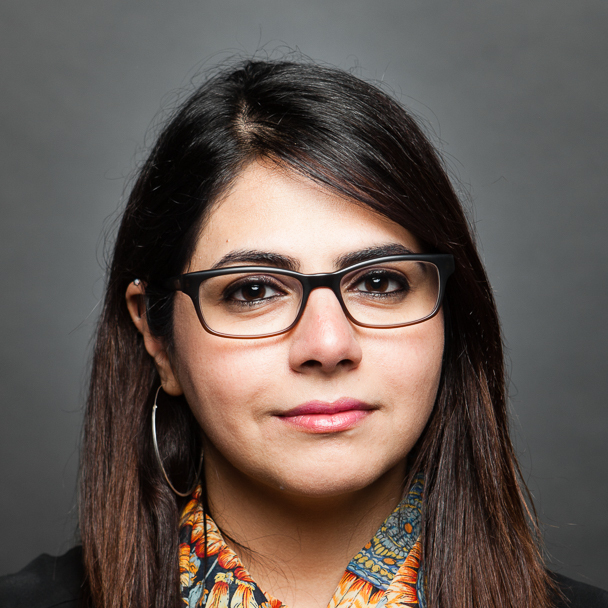 Predictions is a product that can build dynamic user groups based on predicted behavior, determined using a machine learned model, and these user groups can then be targeted using Firebase Cloud Messaging, Remote Config and other technologies. User groups are updated daily to keep your predictions fresh. Churn is a group of users who are predicted to soft churn -- i.e. stop using your app -- in the next 7 days. 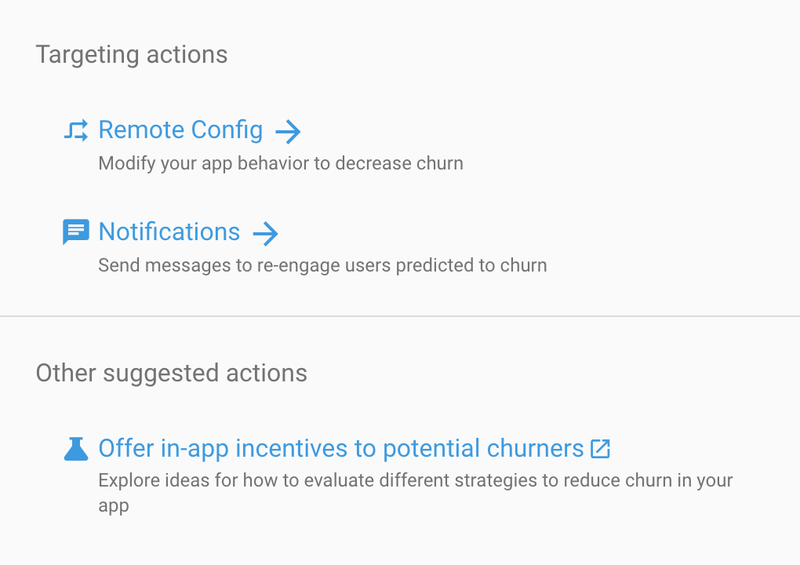 Not_Churn is a group of users who are predicted to stay engaged with your app in the next 7 days. You'll see these three groups right away when you select Predictions in the left nav bar of Firebase Console. You'll notice that each of these cards has actions that you can take upon them. Tolerance: The tolerance slider gives you the ability to tolerate low, medium or high risk of false positives. So, with a low tolerance, your population of users will be smaller, but so also will your risk of false positives. Similarly, with a high tolerance, you'll have a larger population of users, but at a risk of some of them being false positives. In the case of 'churn', a false positive would be a user who is predicted to churn, but in fact continues to use your app. Target Users: This gives you a drop-down on which you can select Remote Config or Notifications for that user group. It also links to some handy guidance for offering in-app incentives. 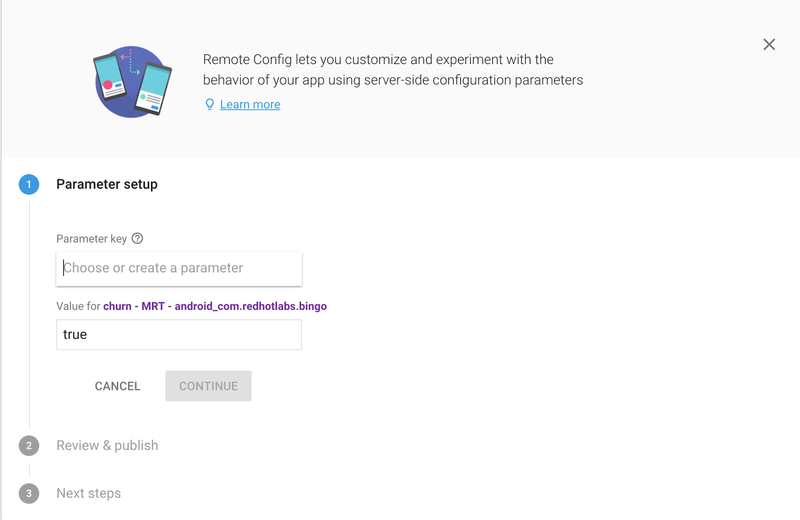 Selecting Remote Config will take you to a new screen where you can specify the remote config parameter that you want to set up, and then the value for it for that population. So, for example if you've been building a game, and a lot of people have churned and you see from feedback that it's too difficult to play, you could set a remote config variable for the difficulty, so that likely churners could get a lower default value set for them, and thus would have an easier experience playing the game. Selecting Notifications will take you to the familiar composer for messages to be sent using Firebase Cloud Messaging, but in addition to the usual options for picking target audience, you'll also get the predicted user group pre-populated as a user segment. This allows you to target notifications at that user group. So, for example, for users at a risk of churning, you could send a notification with an enticement to continue using the app. Creating your own predictions. You aren't limited to the built-in predictions cards, of course, and can create your own based on custom events that you set up in your app. In this case, you'll see a card that allows you to create a prediction. So, for example, in the above case, whenever a user levels up in the game, the level_up conversion event is logged. Thus, you could create a prediction for players who may level up, and incentivize them to continue playing. 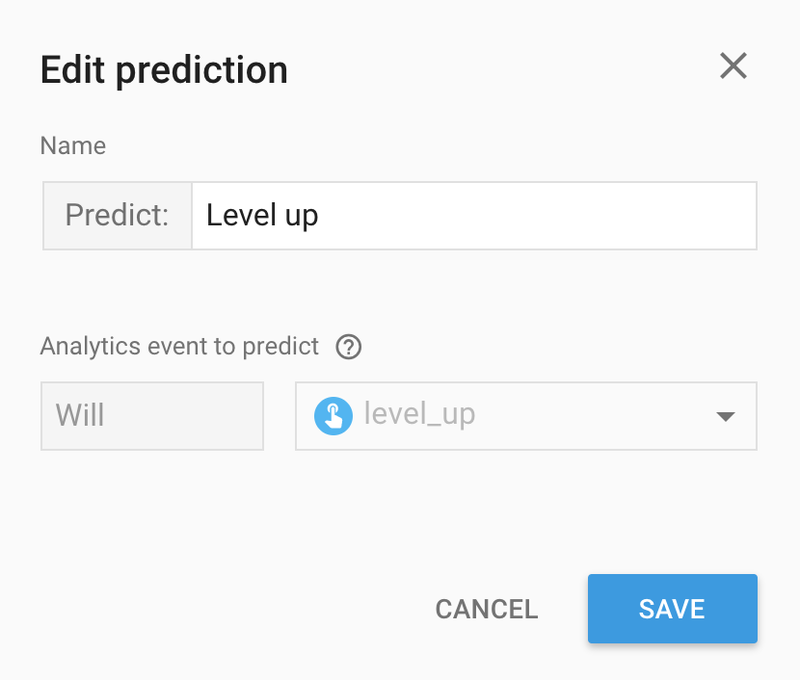 Then, once you've saved your prediction, over time a card will populate on the Firebase Console in the same way as the built-in ones. And this card can be used in the same way as the others -- including targeting users with notifications and Remote Config. 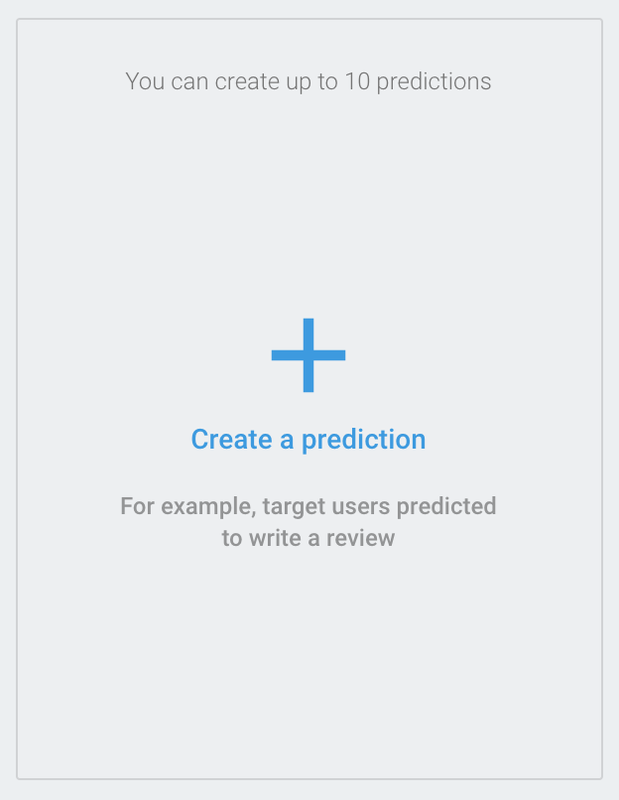 Firebase Predictions is a Beta product, and we're continuing to work on it and improve it. If you have any questions or feedback, please reach out -- and for bugs and product suggestions, you can reach us at firebase.google.com/support. Learn more about Firebase Predictions at firebase.google.com/products/predictions/ or dive straight into our docs right here. Easier scaling with multi-database support!